Get ready for a weekend of art, music, games and fun. 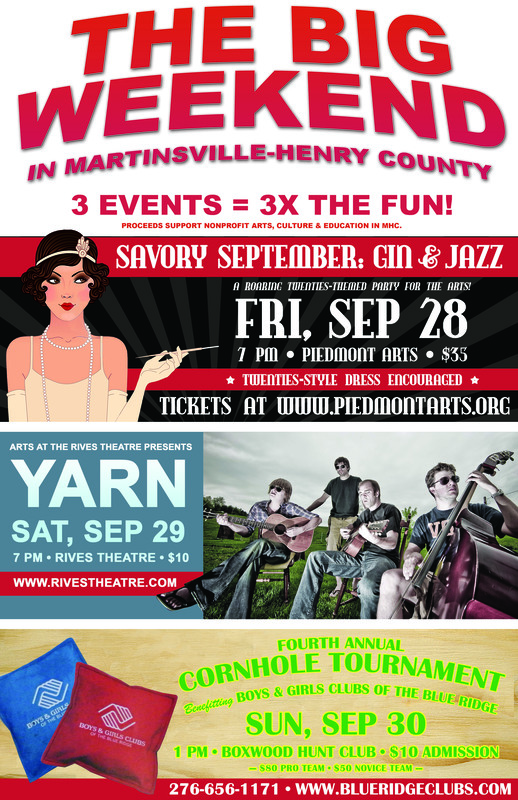 All proceeds support nonprofit arts, culture and education in Martinsville and Henry County. We’re gonna party like it’s 1929! Shine your spats and don your finest flapper flare for this Roaring Twenties-themed party, complete with bathtub gin and bawdy jazz. Heavy hors d’oeuvres and hooch are on the house. Gin & Jazz is sure to be the party of the century, the last century that is! Twenties-style dress encouraged. Yarn is back for a sophomore visit to the Rives Theatre! This Brooklyn-based Americana/Alt-Country band’s sound owes as much to Gram Parsons and Earl Scruggs as to Jerry Garcia and Exile On Main Street-era Rolling Stones. Following in a fine tradition that includes forward thinking roots bands like The Flying Burrito Brothers and New Riders of The Purple Sage, Yarn weaves roots music idioms into a fresh sound that turns on hipsters and fans of country music alike, with technically impressive song-crafting and universal tales from the road of life. Tickets at Studio 107, Woodall’s Music or at the door the night of the show. Join Boys and Gilrs Clubs of the Blue Ridge for a food, beverages and live music. Register online: Pro teams $80; Novice Teams $50.